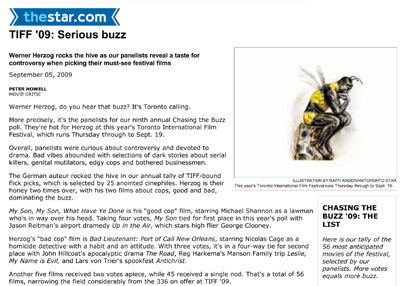 We're very happy to be invited by Peter Howell, movie critic for the Toronto Star, to be part of his 9th annual Chasing the Buzz poll — a panel of 25 critics/programmers/film-buffs name the 3 films they are most looking forward to. Antichrist: "See the film that won the first anti-award from Cannes' ecumenical jury Thursday night at 9pm, then talk to director Lars von Trier, via video conference from Denmark, Friday morning at 9am." Enter the Void: "Gaspar Noé, the stylish and audacious director of Seul Contre Tous and Irréversible, brings a cinematic trip about a low-level drug dealer and his sister... which garnered very mixed reviews." The Hole: "Kudos to Colin Geddes for bringing the festival's first 3-D presentation with Joe Dante's new work, shot in Canada using Paradise FX — the same technology used earlier this year in the remake of the Canadian slasher, My Bloody Valentine."